§ 170-30 Streets, access drives and driveways. § 170-31 Vehicular, bicycle parking facilities. § 170-32 Blocks and lots. § 170-34 Survey monuments and markers. § 170-35 Stormwater management and floodplain controls. § 170-37 Sanitary wastewater disposal and water supply. § 170-38 Parks and open space uses. § 170-39 Historic and cultural resources. § 170-40 Emergency access requirements. The standards and requirements contained in this article shall apply as minimum design standards for subdivisions and/or land developments within the Borough. In addition, subdivisions and/or land developments shall be designed to comply with the requirements of the Zoning Ordinance, the Stormwater Management Ordinance, and regulations of the Pennsylvania Department of Transportation as applicable. All proposed subdivisions and/or land developments shall be designed, laid out, arranged, constructed and coordinated with all presently existing facilities and improvements which serve the tract proposed to be developed, including but not limited to the (a) transportation network, (b) sewer collection, conveyance and treatment facilities, (c) water supply and distribution facilities, and (d) stormwater management facilities, as necessary to accommodate prospective traffic, provide adequate sewer and water service, promote proper stormwater management, facilitate fire protection, prevent flooding and conform to the Comprehensive Plan, including any Urban Growth Boundary, the Official Map, and any regulations or plans adopted in furtherance thereof. All proposed subdivisions and/or land developments shall also be designed, laid out, arranged, constructed and coordinated to insure that abutting properties will continue to have safe and convenient access in accordance with the standards of this chapter or, if such properties do not presently have such access, to have access at least equal to the level existing prior to the proposed subdivision and/or land development. The applicant shall submit studies and reports with the preliminary plan and the final plan which shall clearly identify any assumed, proposed and required improvements to existing facilities. If an applicant submits a study, report or plan which contains improvements assumed to be installed by others and compliance with the design standards in this chapter is based upon the completion of such assumed improvements, the design standards of this chapter shall not be considered as met unless the applicant presents evidence that a governmental entity has budgeted funds and/or has entered into contracts for the assumed improvements or unless a plan for another development which proposes the installation of such improvements has been approved and recorded. Compliance with Borough ordinances required. Whenever the Borough Zoning Ordinance provides that the use proposed by the applicant for subdivision and/or land development approval shall constitute a use by special exception or a conditional use, the applicant shall obtain such special exception or conditional use approval from the Zoning Hearing Board or Borough Council, as applicable, prior to the submission of the preliminary plan. The plan shall be designed and developed in accordance with any conditions which the Zoning Hearing Board or Borough Council has imposed upon such approval. Variances required prior to plan submission. Whenever the applicant proposes to develop a subdivision and/or land development in a manner that would require a variance from any requirements of the Zoning Ordinance, the applicant shall obtain such variance from the Zoning Hearing Board prior to the submission of the preliminary plan. The plan shall be designed and developed in accordance with any conditions which the Zoning Hearing Board has imposed upon the grant of such variance or variances. Compliance with prior approved plans. Whenever all or a portion of the land contained within an application for subdivision or land development approval constitutes all or a portion of land included in a prior subdivision or land development plan approved by the Borough or the Lancaster County Planning Commission and recorded in the Office of the Recorder of Deeds in and for Lancaster County, Pennsylvania, the plan shall comply with all conditions, restrictions and notes imposed on the prior approval and/or included upon the recorded subdivision or land development plan. The applicant shall identify all prior recorded subdivision and/or land development plans of which all or a portion of the land contained in the plan was a part and all conditions, restrictions and notes which affect the current application. Failure to identify all applicable conditions, restrictions and notes of record on prior plans constitutes a violation of this chapter. The applicant shall submit with the application for preliminary plan approval a statement identifying the prior plans reviewed; the conditions, restrictions and notes which would impact development in accordance with the plan for which approval has been requested; and an explanation of the manner in which the proposed plan has been designed to comply with such conditions, restrictions and notes. This information shall be signed by the applicant or the applicant's engineer or landscape architect. The arrangement of streets shall conform to the circulation plan of the county and Borough comprehensive plans, to official maps, and to such county, Borough, and state road and highway plans as have been duly adopted. For streets not shown on the circulation plan or official map, the arrangement shall provide for the appropriate extension of existing streets and shall conform as closely as possible to the original topography. Residential local streets shall be arranged so as to minimize through traffic and discourage excessive speeds. Streets shall be designed with drainage grates that are safe for crossing by bicycles or horse-drawn vehicles. Adequate vehicular and pedestrian access shall be provided to all lots. Curvilinear streets and culs-de-sac should be utilized only where their use will be consistent with adjoining development patterns, topography, and natural features of the site. Culs-de-sac shall not be used where it is possible to provide loop streets that provide better access for emergency vehicles, fewer restrictions for snow removal, and improved pedestrian access. Curvilinear streets shall not be used immediately adjacent to an existing grid street system without providing a transition that continues and protects the historic grid. New project street systems, platted adjacent to developed land, shall not be merely looped back on local access streets within the Borough or village, but shall connect with or be designed to connect with, in the future, streets of a higher class (see Appendix 2). Consideration shall be given to the dispersal of traffic from commercial and employment centers, and to the ultimate functioning of the street system. Editor's Note: Appendix 2 is included at the end of this chapter. Streets shall be laid out to provide convenient and safe access to the property. Where appropriate, the Borough Council may require additional cartway improvements and/or right-of-way width along existing street frontages to accommodate the anticipated traffic increases and to facilitate vehicular turning movements to and from individual lots. Where a development abuts an existing or proposed arterial street, the Borough Council may require the use of marginal access streets, reverse frontage lots, or other such treatment that will provide protection for abutting properties, reduce the number of intersections with the arterial street, and separate the local and through traffic. That the street shall be constructed and maintained to conform to the specifications of this chapter. That the owners of the abutting lots will include, with any future offer for dedication, sufficient monies, as estimated by the Borough, to restore the street to conformance with Borough standards. That an offer for dedication of the street shall be made only for the street as a whole. The method of assessing maintenance and repair cost. That an agreement by the owners of 51% of the front footage thereon shall be binding on the owners of the remaining lots. Arterial street design. The design standards for arterial streets shall be as specified by the Pennsylvania Department of Transportation for state roads, and by Borough road ordinance for roads classified as arterial streets under the Federal Aid System. An arterial street is a street that provides for intercommunity travel. Applications which propose developments or subdivisions along arterial streets must include citations to appropriate current road specifications and standards or include notice of improvement and access approval from the appropriate agency. Determination of required right-of-way and cartway width for local and collector streets. Right-of-way and cartway width for each local and collector street classification shall be as specified in the Borough Code of Ordinances. Streets shall also comply with the requirements set forth in the Borough Code of Ordinances. Each street shall be designed for its entire length, to meet the design requirements of the most intense use with all nonresidential uses designed to commercial/industrial street standards. All plans shall be designed to provide for the entire required right-of-way and cartway. The right-of-way shall be measured from lot line to lot line and shall be sufficiently wide to contain the cartway, curbs, shoulders, sidewalks, graded areas, utilities and shade trees. The right-of-way width of a new street that is a continuation of an existing street shall in no case be continued at a width less than the existing street. Where the right-of-way width of the new street is greater than the existing street, a transition area shall be provided, the design of which is subject to Borough Council's approval. The right-of-way shall reflect future development as indicated by the duly adopted Borough Comprehensive Plan or Official Map. The Borough shall require construction of shoulders and drainage swales where curbs are not required. Shoulders constructed with new streets shall be constructed to the same cross-section as the street. Shoulders constructed adjacent to existing streets shall be constructed with the cross-section identified in § 170-30O. Curbing shall be designed to provide a ramp for bicycles and/or wheel chairs at each intersection, at the principal entrances to buildings which front on parking lots, and at all crosswalks. Construction and placement of curb shall comply with the requirements set forth in the Borough Code of Ordinances. Sidewalks shall be required on both sides of all new streets, along access drives, and adjacent to parking compounds. In conventional developments, sidewalks shall be placed parallel to the street within the right-of-way unless a waiver has been granted to preserve topographical or natural features, or to provide visual interest, or unless the applicant shows that an alternative pedestrian system provides safe and convenient circulation. In commercial and in high density residential areas, sidewalks may abut the curb. In planned developments, sidewalks may be located away from the road system to link dwelling units with other dwelling units, the street, and on-site activity centers such as parking areas and recreational areas. They may also be required parallel to the street for safety and other reasons. Pedestrianway easements 10 feet wide may be required by the Borough Council through the center of blocks more than 600 feet long to provide circulation or access to schools, playgrounds, shopping, or other community facilities. Sidewalk width shall be five feet; wider widths may be necessary near pedestrian generators and employment centers. Where sidewalks abut the curb and cars overhang the sidewalk, widths shall be seven feet. Sidewalks and graded areas shall be constructed according to the specifications set forth in the Borough Code of Ordinances. Vertical alignments. Vertical street alignments shall be measured along the center line. The minimum grade and maximum grade of all streets shall be designed with a grade no greater than 15%. The cul-de-sac turnaround shall be designed with a diameter of not less than 60 feet. Vertical curves shall be used in changes in grade exceeding 1%. The minimum lengths (in feet) of vertical curves shall be 15 times the algebraic difference in grade. For example, if a 3% upgrade is followed by a 4% downgrade, the algebraic difference in grade is [3- (-4) = 7]; the minimum length of the vertical curve would then be 105 feet [15 by 7 = 105]. Where the approaching grade exceeds 7% on any or all streets at a four-way street intersection, or the terminating street at a three-way intersection, a leveling area shall be provided on the street(s) with such excessive grade. Such leveling area(s) shall have a maximum grade of 4% for a minimum length of 75 feet measured from the intersection of the center lines as specified in Appendix 5. Editor's Note: Appendix 5 is included at the end of this chapter. The grade within the diameter of a turnaround at the terminus of a permanent cul-de-sac shall be as specified in Appendix 5. Horizontal alignments. Horizontal street alignments shall be measured along the center line. Horizontal curves shall be used at all angle changes in excess of 2°. Single, long radius curves shall be used rather than a series of curves with varying radii and/or a series of short curves separated by short, straight segments. The minimum horizontal curve radius for streets shall be 150 feet. Perimeter streets. Plans with street locations along the perimeter of a property shall be required to show building setback lines and clear sight triangles within the adjacent properties. Permission shall be obtained from the adjacent landowner. Cartway alignment. The center line of the street cartway shall correspond with the center line of the street right-of-way. Multiple intersections involving the junction of more than two streets are prohibited. The distance between the center line of streets intersecting at grade with a local street shall be no less than 150 feet measured along the center line of the street being intersected based on the safe stopping distance of a road with a design speed of 25 mph at a moderate grade. The distance between the center line of streets intersecting at grade with a collector street shall be no less than 300 feet measured along the center line of the street being intersected based on the safe stopping distance of a road with a design speed of 40 mph at a moderate grade. The distance between the center line of streets intersecting at grade with an arterial street shall be no less than 600 feet measured along the center line of the street being intersected based on the safe stopping distance of a road with a design speed of 55 mph at a moderate grade. Right angle intersections shall be used whenever possible. No street shall intersect another at an angle of less than 75°. The cartway edge at street intersections shall be rounded by a tangential arc with a minimum radius as specified in Appendix 5. The right-of-way radii at intersections shall be substantially concentric with the edge of the cartway. Where appropriate, the Borough Council may require additional traffic lanes to facilitate vehicular turning movements at existing or proposed street intersections within or bordering subdivision or land development plans. Clearly marked crosswalks shall be provided at all intersections when sidewalks or pedestrian easements are provided in a development. Crosswalks may also be required by the Borough Council at other locations to promote the convenience and safety of pedestrian traffic. The design of crosswalks and the materials used shall be consistent with other crosswalks in the area. Safe stopping sight distance shall be provided at all new and existing streets and all new and existing access drive intersections in accordance with the latest edition of the Pennsylvania Department of Transportation Design Manual — Part 2, Highway Design (Publication 13), Section 2.18.F. Sufficient design and plan information shall be submitted with the plan application proving that this minimum standard will be achieved. Such design information shall be sealed by a professional registered in Pennsylvania to perform such design work. At all intersections where stop signs or other stop control devices are not proposed, sight triangle easements or dedicated right-of-way shall be required and shall include the area on each street corner that is bounded by the line which connects the sight or "connecting" points located on each of the right-of-way lines of the intersecting street. The planting of trees or other plantings or the location of structures exceeding 30 inches in height that would obstruct the clear sight across the area of the easements or right-of-way shall be prohibited; and a public right-of-entry shall be reserved for the purpose of removing any object, material or otherwise, that obstructs the clear sight. The distances shown in Appendix 6 between the connecting points and the intersection of the right-of-way lines shall be required. Editor's Note: Appendix 6 is included at the end of this chapter. The Borough Council may disapprove any point of ingress or egress to any lot, tract, parcel, or development from any street or highway when the proposed ingress or egress would create unsafe conditions, reduce the capacity of the adjoining street or highway, or result in substandard circulation and impaired vehicle movement. The Borough Council may require the applicant to provide ingress and egress to a particular lot or tract through the remainder of his property or other properties over which he has control. In approving ingress or egress from any state road or highway, the Borough Council can only approve those access points that are not in conflict with safety standards of the Pennsylvania Department of Transportation (PennDOT). A highway occupancy permit is required for each access point onto a state road or highway. The receipt of a highway occupancy permit does not assume direct approval of the Borough Council. The Borough Council may require the applicant to reapply for a permit if the location of the permit approved access is in conflict with any provision of this chapter or if the Borough Council feels the location of the access will hinder the safe and efficient movement on any state road or highway or the proper development of the site. In the event that, after such reapplication, PennDOT refuses to modify the highway occupancy permit to conform to the provisions of this chapter, the PennDOT decision shall prevail. Street provisions for future developments. Where appropriate, areas shall be reserved for future street usage in conjunction with the development of adjacent tracts. Areas reserved for future street usage will not be required to be improved; however, these areas shall be reserved for street improvements to be provided by the developer of the adjacent tract. Wherever there exists a dedicated or platted area reserved for future street usage along the boundary of a tract being developed, the adjacent street shall be extended into the proposed project provided this use is not adverse to the man-made or natural features of the site. Extension of existing streets. The extension of existing streets that are presently constructed with a cartway different from the standards of this chapter shall be provided with a transition area, the design of which is subject to Borough Council approval. Street improvements. All street paving shall conform to the specifications set forth in the Borough Code of Ordinances. Cul-de-sac streets and P streets. A cul-de-sac or P street will not be permitted when a through street is feasible. The feasibility of a through street will be based on the physical features of the tract proposed for development, the potential for extension of the street to adjoining lands, restrictions imposed by other government regulations, and the ability of the design to meet all other requirements of this chapter. When cul-de-sac or P streets are proposed, the application shall be accompanied by a written analysis of the merits of the design and the reasons that a through street would not be feasible. Approval of cul-de-sac streets shall be at the sole discretion of the Borough Council. Permanent cul-de-sac streets, when permitted, shall be designed to serve a maximum of 250 AADT for residential development and a maximum of 500 AADT for nonresidential development. All cul-de-sac streets shall have a minimum length of 250 feet. Permanent cul-de-sac streets shall have a maximum length of 600 feet. Temporary cul-de-sac streets shall not exceed 800 feet in length. The length of a cul-de-sac street shall be measured from the center line intersection with the through street to the center point of the turnaround. Permanent culs-de-sac shall have a paved, circular turnaround with a minimum radius of 50 feet. The right-of-way for the turnaround shall maintain the same distance between the cartway edge and the right-of-way line as is maintained for the straight sections of the street. Temporary culs-de-sac may have circular, "T" shaped or "hammerhead" shaped turnarounds. Turnarounds shall be constructed completely within the right-of-way. Restoration of paved areas within the right-of-way shall be the responsibility of the developer connecting to the temporary cul-de-sac. Any temporary cul-de-sac street designed for access to an adjoining property or for authorized phased development and which is greater than one lot deep shall be provided with a temporary all-weather turnaround within the subdivision or land development. The use of such turnaround shall be guaranteed to the public until such time as the street is extended. Future access strips. Future access strips and street plugs are rights-of-way reserved for future street improvements. They shall be designed in conformance with the design requirements of a street, and the contiguous parcels must contain proper setbacks and sight distance reservations. Special purpose street. Off-street parking must be provided for all parcels that abut a special purpose street, and the prohibition of on-street parking must be identified along the cartway. Any property which utilizes an access drive shall have frontage along a public or private street. The plan shall note that the access drive does not qualify for dedication to the municipality and that the landowner assumes all responsibility for its maintenance. Vertical and horizontal alignments of such drives must be designed to allow for the safe and convenient circulation of traffic within the development site. The Borough Council may require additional cartway width or turning lanes if it is determined that the intended use and function of the access drive warrants such design to ensure safety and convenience. Parallel parking shall only be permitted along access drives when sufficient cartway width is proposed to accommodate both the travel lanes and parking stalls. Perpendicular parking which would require vehicles to back into the travel lanes of an access drive is prohibited. Access drives shall maintain a center line separation distance of 150 feet from all other access drives and streets along local streets; 300 feet along collector streets; and 600 feet along arterial streets. Access drive intersections with other access drives within the site shall not be subject to such restrictions. Safe stopping sight distance shall be provided at access drive intersections with new and existing streets according to the requirements of § 170-30K(1). The Borough Council reserves the authority to disapprove the location of any access drive intersection with an existing or proposed street as stipulated in § 170-30L. Access drives shall be paved. The paving specification for access drives shall conform to the specification for parking compounds as set forth in § 170-31A. The ownership and maintenance responsibilities for the access drive shall be clearly defined on the plan. The Borough shall assume no responsibility for ownership or maintenance. Access drive requirements shall comply with the requirements outlined in Chapter 200, Zoning, of the Borough's Code of Ordinances. Driveway locations shall not interfere with the normal traffic movement nor be inconsistent with the design, maintenance, and drainage of the street. The Borough Council may limit the number of driveways providing access to a single property or development from collector or arterial streets. Any access from such streets must be designed in conformance with the safe stopping sight distance according to the requirements of § 170-30K(1) and respective intersection separation distance requirements according to the requirements of § 170-30S(5). Driveway access to a local street shall not be located less than 50 feet from the edge of the cartway of any street intersection and shall provide adequate safe stopping sight distance according to the requirements of § 170-30K(1). Driveway access to lots shall be provided to the street of lesser classification. The Borough Council may require the joint or shared use of driveways to provide ingress and egress when such design would increase traffic safety by decreasing the potential for vehicular conflicts. Every lot must be provided with at least one driveway location which meets the above criteria. Should a site contain more than one location which conforms to these requirements, the plan may delineate the range of available driveway locations. As an alternative, the plan may show locations where driveways are not permitted due to noncompliance with this or other applicable ordinance or regulation. Editor's Note: Appendix 35 is included at the end of this chapter. Design and placement of traffic signs shall follow the requirements specified in the Manual on Uniform Traffic Control Devices for Streets and Highways, published by the U.S. Department of Transportation. At least two street name signs shall be placed at each four-way street intersection and one at each "T" intersection. Signs shall be installed under light standards and free of visual obstruction. The design of street name signs should be consistent, of a style appropriate to the Borough, of a uniform size and color, and erected in accordance with Borough standards. Private streets shall be provided with street name signs in conformance with this section. The plan shall note that it is the responsibility of the developer to install the street name signs for private streets. Parking regulation signs shall be placed along roadways within the right-of-way in areas that restrict parking. Site information signs in planned residential developments shall follow a design theme related and complementary to other elements of the overall site design. Utility and shade tree areas. Utilities and shade trees shall generally be located within the right-of-way on both sides of and parallel to the street. (An alternative placement for shade trees is outside the public right-of-way). Utility and shade areas shall be planted with grass, ground cover, or treated with other suitable cover material. Lighting for highway safety shall be provided at street intersections, entryways to commercial land developments, and in parking lots adjacent to public streets. Lighting shall be provided in accordance with an illumination plan designed by Pennsylvania Power & Light or in conformance with the IES Lighting standards contained in Appendix 10. Editor's Note: Appendix 10 is included at the end of this chapter. Spacing of standards shall be equal to approximately four times the height of the standard. The maximum height of standards shall not exceed the maximum building height permitted, or 25 feet, whichever is less. The height and shielding of lighting standards shall provide proper lighting without hazard to drivers or nuisance to residents, and the design of lighting standards shall be of a type appropriate to the development and the Borough. Spotlights, if used, shall be placed on standards pointing toward the buildings and positioned so as not to blind the residents, rather than on the buildings and directed outward which creates dark shadows adjacent to the buildings. All electric, telephone, television, and other communication facilities, both main and service lines servicing new developments, shall be provided by underground wiring within easements or dedicated public rights-of-way, installed in accordance with the prevailing standards and practices of the utility or other companies providing such services. Lots which abut existing easements or public rights-of-way where overhead electric or telephone distribution supply lines and service connections have heretofore been installed may be supplied with electric and telephone service from those overhead lines, but the service connections from the utilities' overhead lines shall be installed underground. In the case of existing overhead utilities, should a road widening, or an extension of service, or other such condition occur as a result of the subdivision and necessitate the replacement or relocation of such utilities, such replacement or relocation shall be underground. Where overhead lines are permitted as the exception, the placement and alignment of poles shall be designed to lessen the visual impact of overhead lines as follows: Alignments and pole locations shall be carefully routed to avoid locations along horizons; clearing swaths through treed areas shall be avoided by selective cutting and a staggered alignment; trees shall be planted in open areas and at key locations to minimize the view of the poles and the alignments; and alignments shall follow rear lot lines and other alignments. Year-round screening of any utility apparatus appearing above the surface of the ground, other than utility poles, shall be required. All vehicular parking facilities and internal drives within parking areas shall be designed to allow for the safe and efficient movement of vehicles within a development and on the adjacent street. Parking facilities shall not be permitted within 10 feet of a side or rear property line unless formal arrangements, satisfactory to the Borough Council, have been made for the establishment of a common parking facility unless otherwise specified in Chapter 200, Zoning of the Borough's Code of Ordinances. Where sidewalks occur in parking areas, parked vehicles shall not overhang or extend over the sidewalk unless an additional two feet are provided in order to accommodate such overhang. Parking areas shall be suitably landscaped to minimize noise, glare and other nuisance characteristics as well as to enhance the environment and ecology of the site and surrounding area. 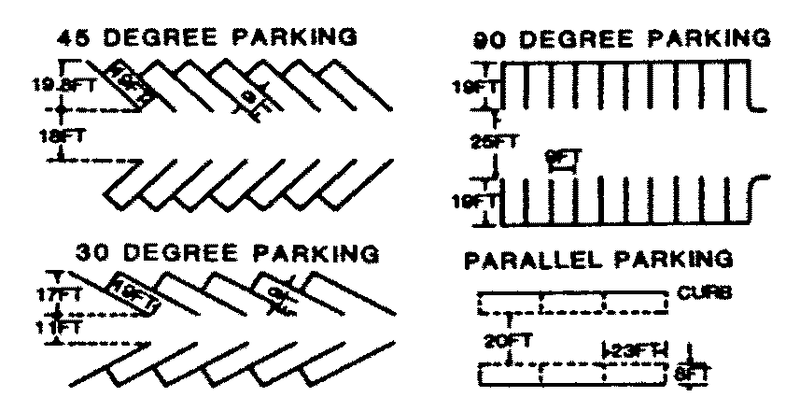 Large parking lots, containing more than 50 spaces, shall be broken down into sections, not to exceed 50 spaces, separated from other sections by landscaped dividing strips, berms, and similar elements. Not less than a four-foot radius of curvature shall be permitted for horizontal curves in parking areas. All dead end parking lots shall be designed to provide, when necessary, sufficient backup area for all end stalls. Painted lines, arrows, and dividers shall be provided and maintained to control parking, and when necessary to direct vehicular circulation. Off-street parking shall also comply with the requirements set forth in the Borough Zoning Ordinance. Crushed aggregate base course with a minimum thickness of six inches, as specified in the Pennsylvania Department of Transportation Specifications, Form 408, and its latest revisions, or other PennDOT approved equivalent. Pavement shall consist of a minimum of 1 1/2 inches of binder courses and one inch wearing surface. Material shall be equal or superior to Pennsylvania Department of Transportation Specifications for Bituminous Surface Course ID-2 and shall be applied in accordance with the Pennsylvania Department of Transportation Specifications, Form 408, and its latest revisions or other PennDOT approved equivalent. Five percent of the first 50 vehicular spaces shall be for bicycle use. If more than 50 spaces are to be provided, at least 3% of the number of spaces over 50 shall be for bicycle use. Each bicycle space shall be equipped with a device to which a bicycle frame and one wheel can be attached using a chain or cable. There shall be adequate separation between adjacent devices to allow bicycles to be attached or removed without moving other bicycles. The devices shall also be suitable for use by bicycles not equipped with kickstands, and the appearance of the device shall be generally consistent with nearby urban design features. Bicycle parking spaces shall be convenient to the structure for which they are provided. They shall be visible from at least one entrance to the structure and shall be provided with lighting. Bicycle parking devices shall permit at least two feet of free space between any bicycle attached to the device and the edge of the curb or sidewalk. For areas where motor vehicles are permitted to park overhanging the curb or sidewalk, the distance shall be increased to four feet. For roads having no curb or sidewalk, the minimum clearance shall be three feet between any bicycle attached to a parking device and the outside edge of the roadway shoulder. Lot configuration. The configuration of blocks and lots shall be based upon the minimum and maximum lot area requirements, the salient natural features, the existing improvements, the proposed improvements, and the adjacent development pattern. Lot configurations should provide for flexibility in building locations, while providing safe vehicular and pedestrian circulation. Lots with areas that are two or more times the minimum requirements shall be designed with configurations that allow for additional subdivision. Building setback lines and building separations shall be provided in accordance with the regulations set forth in the Borough Zoning Ordinance, subject to the provisions of Section 508.4 of the Municipalities Planning Code. Editor's Note: See 53 P.S. § 10508. All blocks in a residential subdivision shall have a minimum length of 300 feet and a maximum length of 10 times the minimum required lot width, not to exceed 2,000 feet. Blocks along arterial streets shall not be less than 800 feet in length. The design of blocks longer than 800 feet shall give special consideration to the requirements of fire protection, pedestrian access, and utility service. The Borough Council may require easements as necessary for these purposes. Nonresidential blocks. Blocks in nonresidential areas may vary from the requirement of Subsection B when required by the nature of the use. Adequate provisions shall be made for off-street parking, loading areas, and traffic circulation. In order to avoid jurisdictional problems, lot lines shall, wherever feasible, follow municipal boundaries rather than cross them. Where a lot is divided by a municipal boundary, the minimum standards of both municipalities shall apply. Generally, side lot lines shall be radial to street right-of-way lines. Exceptions may include cases where proposed lot lines follow existing lot lines, improvements, or natural features. All lots shall front on a public or private street. Principal vehicular access to lots shall be provided from the frontage along the approved street. Lots resulting from a proposed subdivision that will be large enough to be further subdivided shall be configured to facilitate such future subdivision. Adequate street right-of-way shall be provided as necessary. The Borough Council may require a sketch plan of such large lots that indicates the potential future subdivision generally in conformance with the design standards of this chapter. Flag lots proposed to create lots for home sites which are to be located to the rear of an existing tract of land where there is no potential for the construction of a public or private street to provide access to the proposed lot. In such cases, the applicant must demonstrate that there is no potential to construct a street due to (a) severe topographic or other environmental constraints which limit the design of a street, or (b) other factors inherent in the site which make the construction of a public or private street impractical. In such cases, evidence shall be submitted to the Borough Council which documents the above circumstances and demonstrates that the platting of flag lots shall not restrict the development potential and pattern of development of the tract and adjacent lands, shall not result in unsafe driveway locations on public streets, and shall not restrict future development at the maximum lawful density. No more than two contiguous flag lots shall be permitted. The "flagpole" or access portion of the flag lot shall maintain a minimum width of 25 feet and shall not change direction more than once. The area of the flagpole shall not be included with the area of the "flag" or the body of the lot in satisfying municipal zoning standards for minimum lot size unless otherwise specified under the municipal Zoning Ordinance. No portion of any "flagpole" shall be used for on-site sewage disposal or other improvements other than access improvements. The Borough Council may attach any reasonable conditions to the creation of flag lots as it finds necessary or desirable to provide for the orderly development of land and street systems. Double frontage lots are prohibited except where provided as reverse frontage lots. Reverse frontage lots are only permitted when a reduction of driveway intersections along a street with a high volume of vehicular movements is desired. Additionally, reverse frontage lots may be permitted when rear alleys are proposed to provide vehicular access to lots. All reverse frontage lots shall include an identification of the frontage for use as a road access. All residential reverse frontage lots shall have within every rear yard that is adjacent to any street right-of-way, other than an alley, a planted buffer easement of at least 10 feet in depth, running the entire width of the proposed lot, across which there shall be no vehicular access. Location of easements. To the fullest extent possible, easements shall be adjacent to property lines. Easement conflicts prohibited. Nothing shall be placed, planted, set, or put within the area of an easement that would adversely affect the function of the easement or conflict with the easement agreement. Width of pedestrian easements. Pedestrian easements shall have a minimum width of six feet. Pedestrian easements located in the middle of the block pursuant to § 170-30G(4) shall have a minimum width of 10 feet. Width of utility easements. Public utility easements shall have a minimum width of 25 feet, and private utility easements shall have a minimum width of 10 feet. All utility companies are encouraged to use common easements. Stormwater drainage easements required. The applicant shall reserve easements where stormwater or surface water drainage facilities are existing or proposed, whether located within or beyond the boundaries of the property. Easements shall have a minimum width of 20 feet and shall be adequately designed to provide area for the collection and discharge of water, the maintenance, repair, and reconstruction of the drainage facilities, and the passage of machinery for such work. The easements shall clearly identify who has the right-of-access and responsibility of maintenance. Variable petroleum easement widths. Where any petroleum or petroleum product transmission line traverse a subdivision or land development, the applicant shall confer with the applicable transmission or distribution company to determine the minimum distance which shall be required between each structure and the center line of such petroleum or petroleum product transmission line. Additionally, the Borough Council will require, with the final plan application, a letter from the owner of the tract and the right-of-way, a copy of the recorded agreement which shall contain the above data. Sufficient concrete monument locations must be shown on the final plan to define the exact location of all streets and to enable the reestablishment of all street lines. In general, they shall be set on the street line on one side of the street at the beginning and ending of all curves and at those points on the curve at the street intersections necessary to establish the actual intersection. Permanent stone or concrete monuments shall be accurately placed along at least one side of each street at the beginning and end of all curves and at all angles. As an alternative to permanent stone or concrete monuments for streets with concrete curbs, holes may be drilled in the curb along at least one side of each street at the beginning and end of all curves and at all angle points. In the event that any of these points are inaccessible, drilled holes in the curb, offset and referenced from lot corners may be substituted providing there is no more than 300 feet between drilled hole locations. Markers shall be set at all points where lot lines intersect curves, at all angles in property lines and at the intersection of all other property lines. Monument and drill hole specifications. Monuments shall be of concrete or stone, with a flat top having a minimum width or diameter of four inches and a minimum length of 30 inches. Concrete monuments shall be marked with a 3/4 inch copper or brass dowel; stone or precast monuments shall be marked on the top with an identifiable inscription and a drill hole. Markers shall consist of iron pipes or steel bars at least 30 inches long and not less than 3/4 of an inch in diameter. Drill hole specifications. Holes shall be drilled in concrete curbs (with or without PK nails or discs) having a minimum diameter of 1/4 inch. The depth of the holes shall be such that a PK nail or disc, if used, can be set in as close to the surface of the curb as possible. Minimum depth without the use of PK nail or disc shall be 1/2 inch. In the absence of PK nails or discs, chisel or saw marks shall be used to facilitate and identify the drill hole locations. All monuments, markers, and drilled holes shall be placed by a registered professional land surveyor so that the scored marked point, or center of the drilled hole shall coincide with the point of intersection of the lines being monumented or marked. All existing and proposed monuments, lot line markers, property corners, and drill holes shall be shown on the final plan. Those that are proposed shall be labeled as such. Drilled holes in curbing shall be referenced mathematically to a point on the right-of-way line. If stormwater management information provided in accordance with § 170-18 or 170-19 indicates that the existing stormwater management system on the subject tract does not meet the requirements of this section, then stormwater management facilities must be designed and proposed to meet the requirements of the Borough of Denver's Stormwater Management Ordinance. When the proposed stormwater management system will utilize or be integrated into an existing stormwater collection or conveyance system, the existing facilities shall be improved to the standards of this chapter. The applicant shall determine the impacts of any proposed improvements of the existing system to downstream properties. If, in the opinion of the Borough Council, the improvements will cause adverse impacts on downstream properties, the applicant shall mitigate such impacts. Stormwater management. All subdivision and/or land development applications except single lot subdivisions where a principal building exists on the site and no new construction is proposed, lot add-on plans, center line separation plans, and farm-related businesses conducted within existing agricultural buildings shall include stormwater management data in a form acceptable to the Borough Council. The stormwater management data shall identify all proposed stormwater management facilities and supportive information stated in §§ 170-18D(12) and 170-19D(17) of this chapter. Stormwater management data shall be prepared by individuals registered in the Commonwealth of Pennsylvania to perform such duties and include the certificate found in Appendix 15 of the chapter. Developers and consultants are urged, but not required to discuss stormwater management design approaches for specific projects with the Borough Engineer prior to the submission of the preliminary or final plan. Editor's Note: Appendix 15 is included at the end of this chapter. Ownership, administration, and maintenance of stormwater management facilities. Authorize maintenance to be done and lien all cost of the work against the properties of the private entity responsible for maintenance. The agreement, declaration of easements or other legally binding documentation shall be submitted to the Borough Council which may require the agreement to contain provisions requiring the posting and/or periodic payment of escrow funds by the private entity to guarantee proper maintenance of the facility. Erosion and sedimentation. All development applications that involve grading or excavation shall conform to the requirements of Chapter 102 of the Rules and Regulations of the Pennsylvania Department of Environmental Protection, as amended. No changes shall be made in the contour of the land; no grading, excavating, removal, or destruction of the topsoil, trees or other vegetative cover of the land shall be commenced within a proposed subdivision or land development tract until such time that a plan for minimizing erosion and sedimentation control has been reviewed by the Lancaster County Conservation District and approved by the Borough Council, or there has been a determination by the Borough Council, upon recommendation by the Lancaster County Conservation District that erosion and sedimentation plans are not necessary. Stripping of vegetation and grading shall be kept to a minimum. Development plans shall preserve significant natural features, cut and fill operations shall be kept to a minimum, and plans shall conform with topography so as to create the least erosion potential and adequately handle the volume and velocity of surface water runoff. Whenever feasible, natural vegetation shall be retained, protected, and supplemented. The disturbed area and the duration of exposure shall be kept to a practical minimum. Disturbed soils shall be stabilized by permanent vegetation and/or by engineered erosion control and drainage measures as soon as practicable in the development process. Temporary vegetation and/or mulching shall be used to protect exposed critical areas during development. Provisions shall be made to effectively accommodate the increased runoff caused by changed soil and surface conditions during and after development. Where necessary the rate of surface water runoff will be mechanically retarded. Sediment in the runoff water shall be trapped until the disturbed area is stabilized by the use of debris basins, sediment basins, silt traps, or similar measures. Basin and perimeter controls shall be established at the commencement of work on the site. Storage piles shall be protected and stabilized within 30 days. Earth or paved interceptors and diversions shall be installed at the top of cut or fill slopes where there is a potential for erosive surface runoff. In order to prevent pollution of any watercourse and to reduce erosion of soil, sediment control devices shall be installed prior to any grading, filling, or excavation. Such devices shall be designed to retain sediment on the site or flowing adjacent to the site. Within 30 days after completion of grading, all surfaces disturbed by vegetation removal, grading, haul roads, or other construction activity that alters natural vegetative cover, are to be revegetated to control erosion, unless covered with impervious or other improved surfaces authorized by approved plans. Erosion controls may include any combination of engineered or vegetative measures. Floodplain. Floodplain areas shall be established and preserved as provided in the Denver Borough Zoning Ordinance. A hydrologic report prepared by an individual registered in the Commonwealth of Pennsylvania to perform such duties. A hydrologic report prepared by an agency of the county, state, or U.S. Government. In case of any dispute concerning when, where, and how the floodplain is to be established, the Borough Council will determine the ultimate design criteria and/or flood boundary limits. Whenever a floodplain is located within or along a lot, the plan shall include the boundary of the floodplain, along with the elevation or locational dimensions from the center line of the watercourse; a plan note that the floodplain shall be kept free of structures, fill, and other encroachments; and a plan note that floor elevations for all structures adjacent to the floodplain shall be two feet above the one-hundred-year-flood elevation. Stream improvements whose sole purpose is to improve aquatic life habitat and which are approved by the Pennsylvania Fish Commission. Floodproofing and flood hazard reduction structures to protect existing buildings. Public and private utility facilities, except buildings. Water-oriented uses (except building), e.g., docks, piers, boat launching ramps, hatcheries. Culverts, bridges, and their approaches for floodplain crossings by streets, access drives, and driveways. Plans for any of the eight uses within a floodplain permitted under Subsection D(4) shall be incorporated into the design plans and shall be subject to approval by the Borough Council. The plans shall demonstrate that the proposed uses do not increase the height or frequency of floodplain water; are installed so as to withstand the maximum volume, velocity, and force of floodplain water; are flood and flotation proof; do not create unhealthy or unsanitary conditions; and do not degrade quality of surface water, or the quality of groundwater. The inclusion of a floodplain within lots in order to meet minimum lot area and/or yard requirements is allowed provided each such lot contains sufficient area exclusive of the floodplain for buildings and, when applicable, on-lot sanitary wastewater disposal systems and replacement drainfield area unless otherwise specified in the Borough Zoning Ordinance. It is recommended that the five-hundred-year floodplain corridor be identified on plans and that any structures located between the one-hundred- and five-hundred-year floodplain be floodproofed to the limits of the five-hundred-year floodplain corridor. Wetlands. In addition to the above requirements no subdivision or land development shall involve uses, activities or improvements which would entail encroachment into, the regrading of, or the placement of fill in wetlands in violation of state or federal regulations. Applicants must submit evidence to the Borough Council that, if wetlands are present on the site, the Pennsylvania Department of Environmental Protection (Bureau of Dams and Waterway Safety) and the U.S. Army Corps of Engineers have been contacted to determine the applicability of state and federal wetland regulations. Any approval of the Borough Council shall be contingent on full compliance with any requirements of any regulatory agency, and no action by the Borough Council shall be relied on in lieu of a permit issued by the appropriate agency. Landscaping shall be provided, consistent with the standards of this chapter, in all subdivisions and land developments. Buffer planting shall be provided along the rear of reverse frontage lots and along the side and rear lot lines of commercial or industrial properties where such lots abut residentially zoned property. Parking and buildings are prohibited within the buffer area. The use of the buffer area for accessways shall be limited. 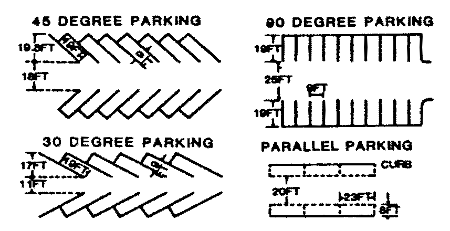 Buffer areas shall consist of one row, staggered, of mixed evergreen and deciduous trees which shall be at least six feet in height when planted and shall be spaced not more than 10 feet apart on center and two rows, staggered, of mixed broad leaf and needle evergreen shrubs which shall be at least three feet in height when planted and shall be spaced not more than five feet apart on center. The trees shall be of such species so as to attain a height at maturity of not less than 20 feet. The shrubs shall be of such species as to provide continued screening from the ground to a height of six feet at maturity. Deciduous plant materials shall comprise no more than 30% of the number of plants in the buffer. The required height of the buffer planting may be achieved in part by mounding or installation of plants along a berm. Service loading and trash disposal areas such as dumpster or compactor sites shall be effectively screened so as not to be visible from parking areas, roadways, or adjacent properties. Such areas shall be screened with a combination of architectural masonry (or fencing) and landscaping with a height of at least six feet. Parking and storage of vehicles in front yards of properties, other than lots in single-family subdivisions, shall be screened from the public right-of-way by an earthen berm and/or plant matter which provides a dense visual screen to four feet in height at maturity. Plant matter shall consist of two rows of mixed broad leaf and needle evergreen shrubs planted in staggered rows. Plants shall be spaced not more than five feet apart on center and shall be at least three feet in height when planted. Additional planting in the form of non-canopy trees and deciduous shrubs is acceptable. All planting shall be performed in conformance with good nursery and landscape practice. Plant materials shall conform to the standards recommended by the American Association of Nurseryman, Inc., in the American Standard of Nursery Stock, ANSI, current edition, as amended. Existing wooded areas. Existing wooded areas shall be protected to prevent unnecessary destruction. At least 25% of the number of trees (minimum trunk caliper of five inches at six inches above ground) that exist at the time of plan submission shall be maintained or replaced immediately following construction. Replacement trees shall be a minimum trunk caliper of two inches at a height of six inches above finished grade and located within unbuildable sections of the site (i.e., floodplain, steep slope, and setback areas). Plans shall be submitted showing existing trees and proposed construction and which indicate conformance with this section. The trees shall be nursery grown in a climate similar to that of the locality of the project. Varieties of trees shall be subject to the approval of the authority that accepts ownership of the street. All trees shall have a normal habit of growth and shall be sound, healthy, and vigorous; they shall be free from disease, insects, insect eggs, and larvae. The trunk diameter, measured at a height of six inches above finish grade, shall be a minimum of two inches. Trees shall be planted between the street right-of-way line and the building setback line except where the municipality has authorized placement of trees within the street right-of-way. The trees' growth shall not interfere with the street cartway, sidewalk, or utility line. Street tree branching shall not interfere with clear sight triangles. Typical branching shall not be within 10 feet of ground level after 10 years of growth. All planting shall be performed in conformance with good nursery and landscape practice and to the standards established by the authority which accepts ownership of the planting. Requirements for the measurements, branching, grading, quality, balling, and the burlapping of trees shall follow the code of standards recommended by the American Association of Nurserymen, Inc., in the American Standard for Nursery Stock, ANSI Z60, current edition, as amended. A minimum of two canopy street trees shall be provided for every 100 feet of public right-of-way. Street trees shall be placed a minimum of 40 feet apart along the right-of-way, and shall be located so as to maximize the growth potential of the plant material, minimize the potential for root interference with public infrastructure, and enhance the quality of the development. A list of acceptable street trees to be utilized in the design shall be obtained from the Borough Shade Tree Commission. No one species shall comprise more than 25% of the entire number of street trees in a particular development. Street trees are to be maintained and guaranteed for a minimum of two years. Planting of trees shall occur within the standard planting season (March through November). No more than 1/3 of the tree shall be damaged or dead without replacement. Replacement trees shall conform to all requirements of this section and shall be maintained and guaranteed for a minimum of two planting seasons. Ground cover. Ground cover shall be provided on all areas of the project to prevent soil erosion. All areas which are not covered by paving, stone, or other solid material shall be protected with a suitable ground cover, consisting of spreading plants, including sods and grasses less than 18 inches in height. Sanitary wastewater disposal. The applicant shall be required to connect all new subdivisions and land developments to the existing Borough-owned sanitary wastewater disposal system. When appropriate, the Borough Council may grant conditional approval of the final plan on the receipt of the approval of the Plan Revision Module prior to the sale of lots or commencement of construction. When a Plan Revision Module for Land Development is not required, or such approval has been waived by the Borough Council, written notice of such action shall be submitted. Be dated within six months of the plan application. Identify the term of the reservation. Provide capacity for the entire development (partial capacity, based on phases of development, will not be acceptable). The final plan application shall include a statement from the Borough Council indicating approval of the plans for design, installation and financial guarantees as well as indicating the reservation of sufficient capacity to accommodate the project. Water supply. The applicant shall be required to connect all new subdivisions and land developments to the existing Borough-owned water distribution system. Whenever the water supply system contains sufficient capability or is planned to have such capability within two years from the date of final plan approval, fire hydrants shall be provided; when provided, the location and kind of fire hydrant shall meet the specifications of the local fire company and the Borough when applicable. A copy of the approval of such system by the appropriate agency or utility company that provides the service shall be submitted with the final plan. Suitable agreements shall be established for the ownership and maintenance of such a distribution system. Hydrants shall be spaced to provide necessary fire flow, and the average area per hydrant typically should not exceed 120,000 square feet. In addition, hydrants shall be spaced so that each residence shall be within 300 feet of a hydrant. A hydrant shall be located at all low points and at all high points with adequate means of drainage provided. If an approved water system will be extended to the subdivision within six years, the Borough Council may require installation of a capped water distribution system. The final plan application shall include a statement from the Borough Council indicating the approval of the plans for design, installation, and financial guarantee. All plans for residential subdivision of land or residential land developments shall provide for the dedication of land for park and open space uses, and/or, upon agreement by the applicant, the construction of recreation facilities, the payment of fees in lieu thereof, the private reservation of land, or any combination thereof. All dedications of land for park and open space purposes shall be consistent with standards contained within an officially adopted municipal comprehensive plan if such chapter meets the intent and criteria of Section 503(11) of the Pennsylvania Municipalities Planning Code. Editor's Note: See 53 P.S. § 10503(11). Any such dedications shall be determined to be acceptable and approved by the Borough Council. General requirements. Applicants shall designate areas of residential subdivisions or residential land developments for parks, playgrounds, or other public open space and recreational uses in accordance with the provisions of the Borough's Comprehensive Park, Recreation, and Open Space Plan. If no municipal standards are provided, dedication shall be in accordance with the requirements of this chapter (§ 170-38). If the applicable park and open space plan specifically designates a future park site within the proposed development, all plans shall be designed in conformance with such provision and shall identify the location of the land to be dedicated such that it corresponds to the park and recreation plan designation. The applicant shall make an irrevocable offer of dedication of such land to the Borough, as required by the Borough Council. Title to such land shall be good and marketable, free of liens or other defects, and acceptable to the solicitor of the municipality or other entity that will accept dedication of the land. The Borough Council may, upon agreement of the applicant, authorize the transfer of the land to a homeowner's association or to a nonprofit corporation whose purpose is the conservation or preservation of land. Consistent with the National Recreation and Park Association, the amount of park and open space land to be dedicated shall equal .25 of an acre per each 100 projected residents or fraction thereof. The developer shall provide the Borough Council with information concerning the density based upon the number and type of dwelling units proposed. In the event of a dispute as to the estimated population of the proposed residential subdivision or land development, the determination of the Borough Council shall control. Residential subdivisions of land involving less than two lots individually or cumulatively, and residential land developments consisting of less than five units of occupancy individually or cumulatively, shall be exempt from this requirement. Residential subdivisions of land where more than 20% of the units are to be reserved for the housing of low-income households or where the housing is financed by public monies, may be exempted from these requirements if adequate parks and open space is provided by other means. The applicant shall enter into an agreement with the Borough Council to provide low-income housing and shall demonstrate that such housing is affordable to low-income households within the county. A low-income household is defined as a household earning less than 50% of the median family income of Lancaster County. After development, it shall be the responsibility of the developer to present evidence to the Borough Council that the housing, as constructed, is affordable to low-income households. Failure to provide low-income housing when dedication of park and open space land has been exempted because of the pledge to provide such housing shall constitute a violation of this chapter and shall require that the applicant pay a fee in lieu of the dedication in accordance with Subsection D herein. Fee in lieu of dedication. Notwithstanding anything contained in the above subsections, the applicant may, with the consent and approval of the Borough Council, elect to pay a fee to the Borough in lieu of the park and open space dedication. N by (average FMV of one acre) = fee. Where: N = the number of acres required to be dedicated for park and open space purposes, calculated in accordance with § 170-38C, and FMV = fair market value. If the applicant is the equitable owner, or purchased the land in fee simple more than two years prior to the preliminary or final plan submission, an opinion of value of the property by a state certified appraiser acceptable to the Borough Council. Any applicant aggrieved by the fee established shall have the right to secure a second opinion of value of the property by a state certified appraiser acceptable to the Borough Council. The two estimated values shall be averaged, with the result being the amount upon which the fee will be based. Such fee shall be payable to the Borough Council prior to the recording of each final phase of the plan and shall be in an amount equal to the percentage of the total number of dwelling units in the phase. Parkland acquisition fund. All fees paid by the developer in lieu of dedication of park and open space land shall be paid to Denver Borough and upon its receipt shall be deposited in a separate interest-bearing account. Fees deposited to this account shall be administered as required by the Pennsylvania Municipalities Planning Code (Act 247 of 1968, as amended by Act 170 of 1988, and as subsequently revised). The park and open space land shall be reasonably located so as to serve all of the residents of the subdivision or land development. The park and open space land shall be accessible from a public street or shall adjoin and become a part of an already existing public park or open space area which is accessible from a public street. Where access to the park is by public road, the width of the frontage shall be a minimum length deemed necessary by the Borough Council for access, visibility of the site, and public safety. No more than 25% of the park and open space land shall contain detention basins or other stormwater management facilities, or be located within a floodplain or wetland unless such area is part of a linear trail or greenway along an existing watercourse. The park and open space land shall be compact and contiguous and shall meet lot configuration requirements for lots within a residential subdivision unless the land shall be used as a continuation of an existing trail as set forth in Subsection G, as a trail or linear park as set forth in Subsection H herein, or the land is located adjacent to and combined with existing park and open space land, or specific topographic features require a different configuration. An example of such topographic features would be the provision of public open space along a scenic creek. When the park and open space land required to be dedicated is less than five acres in size, the park and open space land shall be located at a suitable place on the periphery of the subdivision or land development so a more usable tract will result when additional park and open space land is obtained upon development of the adjacent land. When public park and open space land exists adjacent to the tract to be subdivided or developed, the park and open space land shall be located to adjoin and enlarge the presently existing park and open space land. At least 50% of the finished grade of the site shall have a slope of 3% or less unless the land shall be used as a continuation of an existing trail as set forth in Subsection G, as a trail or linear park as set forth in Subsection H herein, or the preservation of specific, valuable topographic features results in a greater slope (e.g., provision of public space along a scenic watercourse). The park and open space land shall be accessible to utilities such as sewer, water, and power that are provided within the subdivision, and if so requested by the Borough Council, the developer shall extend such utilities to the park and open space land. If the developer is planning to construct facilities for recreation on the dedicated property as an amenity for the development, such facilities shall be constructed in accordance with current standards established by the National Recreation and Park Association. Where applicable, facilities constructed shall also comply with the accessibility guidelines of the Americans with Disabilities Act of 1990. Playground equipment constructed or placed on parkland shall be in compliance with guidelines from the Consumer Products Safety Commission. The points at which the trail enters and exits the tract shall remain unchanged. The proposed alteration exhibits quality trail design according to the generally accepted principles of landscape architecture. The proposed alteration does not run coincidentally with the paved road intended for use by motorized vehicles. The land set aside for the continuation of such existing trail shall be included within the amount of park and open space land required by Subsection C herein. Actual dedications of land shall be a minimum width of 75 feet, and, if to be dedicated to the Borough, must be approved by the Borough Council. The trail or linear park shall conform to any applicable Borough master park and open space plan, any county-wide trail and recreation master plan, and appropriate Borough Comprehensive Plans. The minimum right-of-way width of an easement containing a trail which crosses private land shall be 10 feet. Easements may be dedicated to the Borough or other organization which, in the judgment of the Borough Council, is appropriate. In all cases, however, such easements must provide for public use at reasonable times. Trails shall have a vertical clearance of no less than 10 feet. Width of the trail surface may vary depending upon type of use to be accommodated, but in no case shall such width be less than five feet. Borough fund reimbursement. Borough Council may from time-to-time decide to purchase land for parks in or near the area of actual or potential development. If the Borough Council does purchase park and open space land within a distance of 1/2 mile, subsequent park and open space land dedications within that area may, upon agreement with the applicant, be in cash only and shall be calculated on a percentage basis to reimburse the Borough's actual cost of acquisition and/or cost of development of such land for park and open space purposes. The cash amount shall be equal to the sum of the average price per acre of such land plus the actual costs of adjacent streets and on-site utilities (or an estimate of such actual costs provided by the Borough Engineer) divided by the number of lots or dwelling units in the development. Once the Borough has been reimbursed entirely for all such park and open space land, this subsection shall cease to apply and the other subsections of this section shall again be applicable. Additional recreation reservations. The provisions of this section are minimum standards and shall not be construed as prohibiting a developer, with the approval of the Borough Council, from dedicating or reserving other land for recreation purposes in addition to the requirements of this chapter. Private reservation of land. Notwithstanding anything contained in the above sections, the applicant may, with the consent and approval of the Borough Council, elect to fulfill the open space requirements through the private reservation of a recreation area. That the land cannot be sold or disposed of by the association except to another organization formed to own and maintain said open space and without first offering to dedicate the land and improvements to the Borough. If such lands are to become common elements of a homeowners' or unit owners' association of any type, then such association's organizational bylaws must conform to the requirements of applicable state law. Construction of recreation facilities. Notwithstanding anything contained in the above subsections, the applicant may, with the consent and approval of the Borough Council, elect to fulfill the open space requirements through the construction of recreational facilities. All approved recreation facilities constructed in lieu of land dedication shall be completed and dedicated to the Borough before 50% occupancy has been reached in any applicable subdivision or land development. The Borough Council may avail itself of all remedies provided by the Municipalities Planning Code, including but not limited to the withholding of permits to ensure compliance with this provision. The State Historic Preservation Officer determines that the project will not disturb the cultural significance or artifacts on the site. Method of survey. If a complete archaeological survey is required, it shall be conducted under the supervision of a professional archeologist in compliance with standards prescribed by the Pennsylvania Historical and Museum Commission. Even if a complete survey is not required, the Borough Council may, upon advice of the State Historic Preservation Officer, require the developer to retain the services of, and have present at the site during any excavations or trenching, an archeologist with authority to investigate and document any cultural material that might be unearthed. Report required. A complete copy of the report of the archeologist, including a copy of the field notes shall be submitted to the Borough Council and the State Historic Preservation Officer. Arrangements shall be made by the developer for transfer of any significant artifacts to a depository where such items can be conserved and made available for future study. Preservation of historic features. Subdivisions and land developments shall be designed to preserve, adaptively reuse, or otherwise provide for the historic features of Lancaster County. Modifications or exterior alterations to historic features or sites or new construction adjacent to historic features shall be consistent with the Secretary of the Interior's Standards for Rehabilitation of Historic Properties as published by the National Park Service. Subdivisions and land developments shall also be designed so that new structures do not block historic views, or obstruct the view of historic properties, and new construction should be visually complementary to historic structures, consistent with the Secretary of the Interior's Guidelines. If because of size, scale, construction material, or type of use a proposed land development or subdivision would jeopardize the historic value of a site or structure, such new construction shall be screened or otherwise visually buffered. Demolition restricted. No historic feature as defined of this chapter shall be demolished or moved from its original foundations without approval of the Borough Council. The applicant shall submit to the Borough Council a letter from either the State Historic Preservation Officer or from the Preservation Trust of Lancaster County identifying the significance of the property, potential effects of the project that would be adverse and possible mitigation measures that could be employed. In evaluating any request for demolition of a historic feature the Borough Council shall take into account the significance of the property, the condition of the feature the potential for repair, restoration, stabilization, and reuse, the impact of the feature in relation to the total project, and the hardship, if any, on the applicant. Retention of local names. Applicants are encouraged to perpetuate historic names or geographic references that are traditionally associated with the area in which a project is located, rather than proposing project names that are not consistent with Lancaster County traditions or culture. All subdivisions or land developments containing 50 or more dwelling units or nonresidential buildings containing 20,000 or greater square feet of gross floor area shall be provided with at least two separate and distinct means of access for the subdivision or land development. Access may be provided through the location of two or more public or private streets, each of which intersects with an existing public street. Such public or private streets shall meet all the requirements of this chapter concerning design and construction. Access for a land development may be provided through two or more driveways into the land development. Such driveways shall be separated by a distance of at least 150 feet and shall comply with all requirements of this chapter. If the applicant is unable to provide access to the subdivision or land development through two or more public or private streets, each of which intersects with an existing public street or two or more driveways which intersect with one or more existing public streets, an emergency access shall be provided. The emergency access shall be improved so that emergency vehicles may safely transverse it and shall be indicated on the plans. The emergency access shall be accessible to the providers of emergency services within the Borough. Applicants proposing to provide emergency access shall submit evidence of such approval. The emergency access may be located so that access to the subdivision or land development is gained from a public street at a location unsuitable for regular access with an existing public street. The emergency access may be located so that access is gained from an adjacent tract. For example, a subdivision or land development adjoining a parking lot of another use may provide emergency access through a point with a break chain. Applicants with plans indicating emergency access through an adjoining private tract shall provide evidence that the adjoining property owner has consented to such emergency access location.